Did you know from java 1.7 you can catch multiple exceptions in a single catch block ? Until java 1.6 if we wanted to catch multiple exceptions in a single java program we have to write multiple catch blocks. This leads to duplicity of code making program lengthy and quite tough to read. 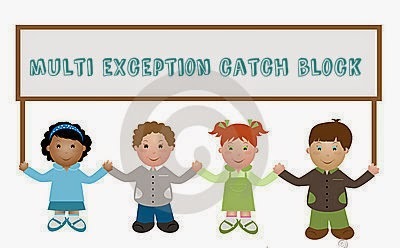 But from java 1.7 we can catch multiple exceptions in a single catch block. Above example code can be rewritten in Java 1.7 and higher version as. Exception type parameters must be separated by a pipe symbol. We are not allowed to pass alternate exception in a multi exception catch block. Violation it will lead to a compile time error. By default variable in multi exception catch block is implicitly final, hence no other assignment on the same variable are allowed. Violation the rule will give a compile time error. · Byte code generated for above example using java 1.6 and java 1.7 + version have no changes.